Troubleshooting, testing and inspection skills on an emergency call out to an unknown and complex production line, with strict time frames to get the facility operational again. One of the many glass line control panels that had heat and smoke damage and had halted production on the glass line. Gentek manufacture PVC frames and windows out of their Colonel Talbot Road facility just outside of London. Gentek were not a regular customer, but knew that PTN Electrical had good troubleshooting skills and subsequently contacted us at 6.45am on a Monday morning to request urgent assistance. The glass production line was not working and as this production line is crucial to the plant’s operation, it was imperative that the fault was found quickly so as not to impact production. The glass line is about 160 feet in length and is controlled by multiple panels, plc controls, motors, variable frequency drives, sensors, safety systems and field wiring. This particular production line takes sheets of glass in one end, cleans the glass, laminates and seals the glass and a window comes out the other end. 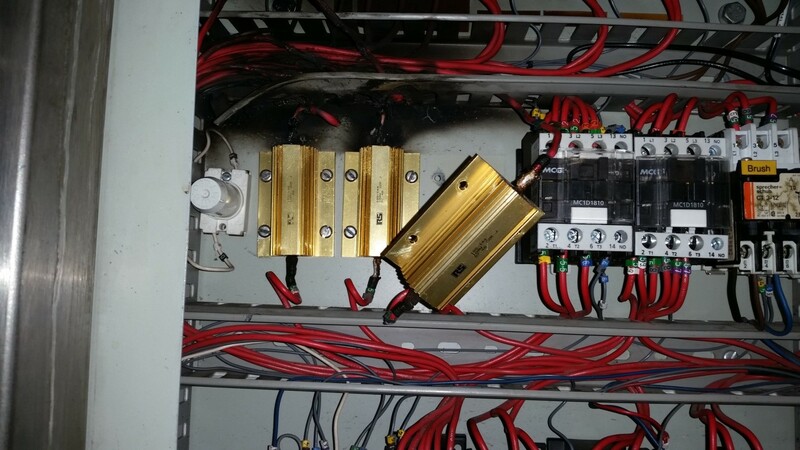 Upon arrival, the electrician tested and inspected the line and found that the panel that controlled the glass washing system had overheated from the motor brake resistors. The 22 ohm resistors had burnt out and caused a lot of heat and smoke damage within the panel, including melting the cables. It was discovered that the production machine had been manufactured in the UK, so our first task was to find replacement motor brake resistors and to rewire the damaged cables in the control panel. The resistors were a specialist item and not available in stock. Fortunately though we were able to source replacement motor brake resistors in the US, but these were not available for 48 hours. Upon speaking to the representative of the machine manufacturer in the UK, it was suggested that this machine could be operated without the motor brake resistors until they arrived at Gentek. But the representative did warn against using the machine without the resistors for longer than 48 hours. In the meantime, the fire damage in the control panel was rewired and the control panel was made operational with a process of elimination and help from schematics. But another two areas of the glass line were also found to be faulty due to repercussions of the heat and smoked damaged control panel. This involved the drive contactors and overloads, fuses and roller speed potentiometers for the other motor drives. Replacement parts were sourced on site and the repairs were made. Time was ticking by and the afternoon shift would soon be arriving for work. Gentek management was very concerned about whether production would start in time and whether they should cancel the shift altogether. PTN Electrical was under a massive amount of pressure to get the line working to ensure the afternoon shift started on time. The two-man team from PTN Electrical worked diligently, ensuring every part of the glass production line came together. And at 1.30pm the green light was given from PTN Electrical to a much relived Gentek management team for the start of the afternoon shift. Once the motor brake resistors arrived at Gentek on Wednesday morning, the PTN Electrical crew returned to site and prepared the production line to install the replacement motor brake resistors. This was conducted during the facility’s scheduled lunch break and the glass line continued to operate with its new motor brake resistors. This was another great job by PTN Electrical. When the pressure is on, you can depend on them to perform and get things working again. Gentek is now a new customer and is looking to have the glass line panel completely rewired.